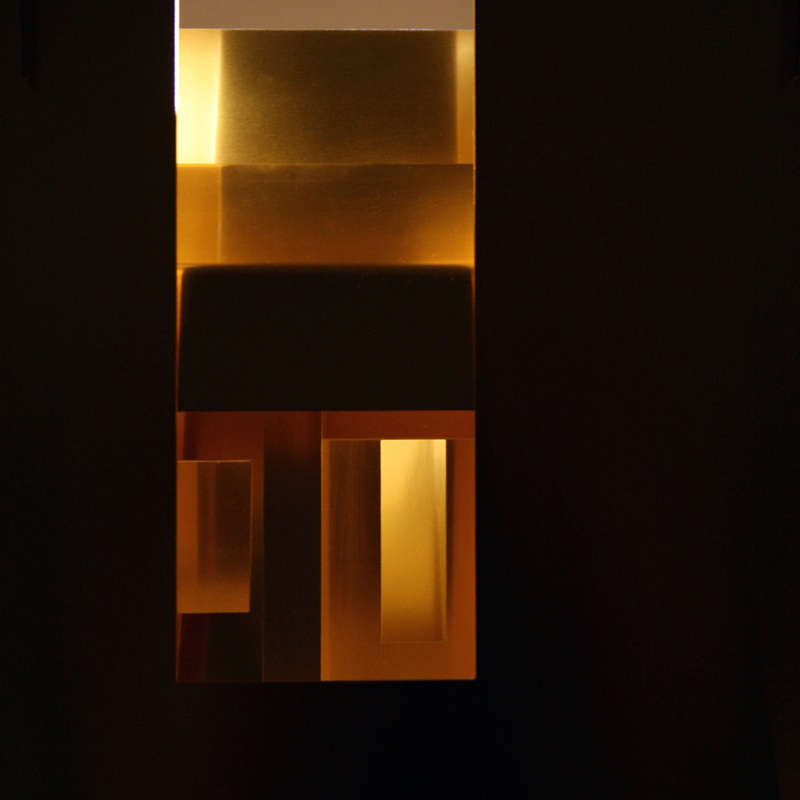 though working nearly a century apart, john soane (1753-1837) and le corbusier (1887-1965) have both transformed and influenced the way we look at and experience spaces through the modulation of light and views. not professionally trained as architects, soane and le corbusier used their studios as laboratories and venues for experimentation. their unconventional approaches and opposition to the traditions of architecture caused some controversy–soane’s use of blank walls without classical ornamentation, and use of windowless screen walls was seen just as contentious as le corbusier’s blank white walls and horizontal windows. 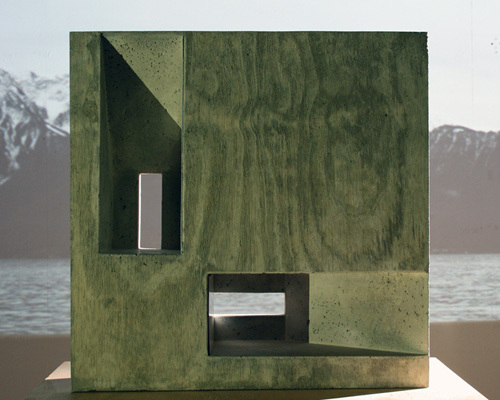 storp weber architecture selected john soane’s own house in lincoln’s inn fields in london; and le corbusier’s ‘ville le lac’–built for his parents on the shore of lake geneva in vevey, switzerland–as case studies for understanding the architects’ manipulation of the built space, and their resulting illusions. soane’s dwelling is on a very confined site that reveals no views towards the back, and offers no possibility to allow light into the internal spaces through a conventional window. these restrictions saw him design a series of roof lanterns–known as lumiére mystérieuse–that provided him with the possibility of letting luminescence through a space along a flank wall, reflecting it into the interior, and illuminating objects displayed on these walls in a dramatic way. 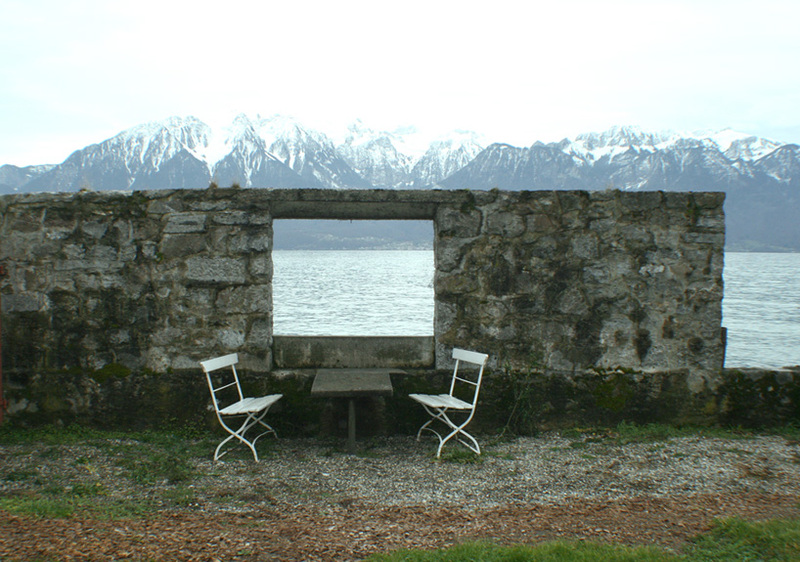 le corbusier’s ‘villa le lac’ experienced similar changes. it was built on a tight budget so a number of construction errors occurred such as a leaking roof, as well as problems related to the rising levels of the neighbouring lake, causing the basement to rise. as a result, the home’s side walls began cracking, and because of moisture it had to be re-painted, with an aluminium skin applied to cover up the damage. 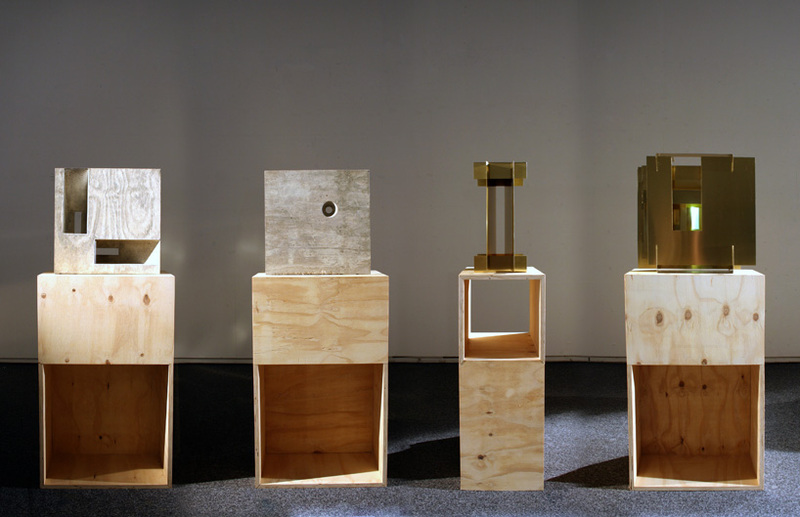 storp weber architecture has synthesized the modernist and neoclassical techniques of the british and french designer respectively, through four installation pieces that express the material and fabrication strategies of their iconic work, realizing two cast concrete volumes that respond to le corbusier; and two brass compositions that attempt to decode the efforts of soane. le corbusier joined auguste perret, a pioneer in the use of concrete in france, in the year 1907 after meeting him in istanbul. 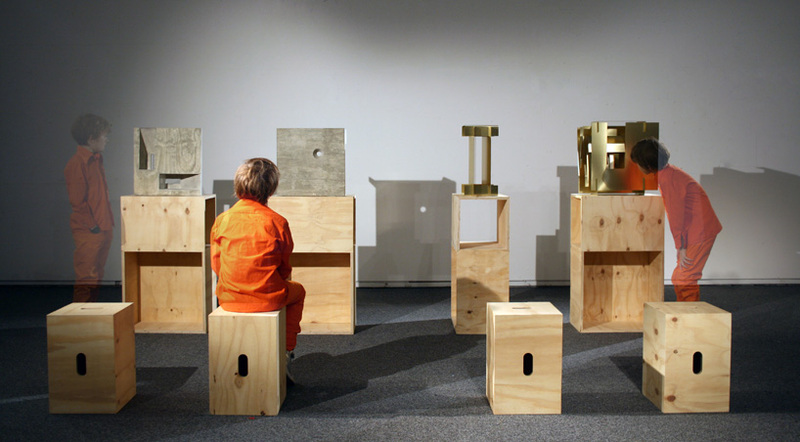 after a short stint at his studio, he quickly departed to work in berlin with peter behrends. 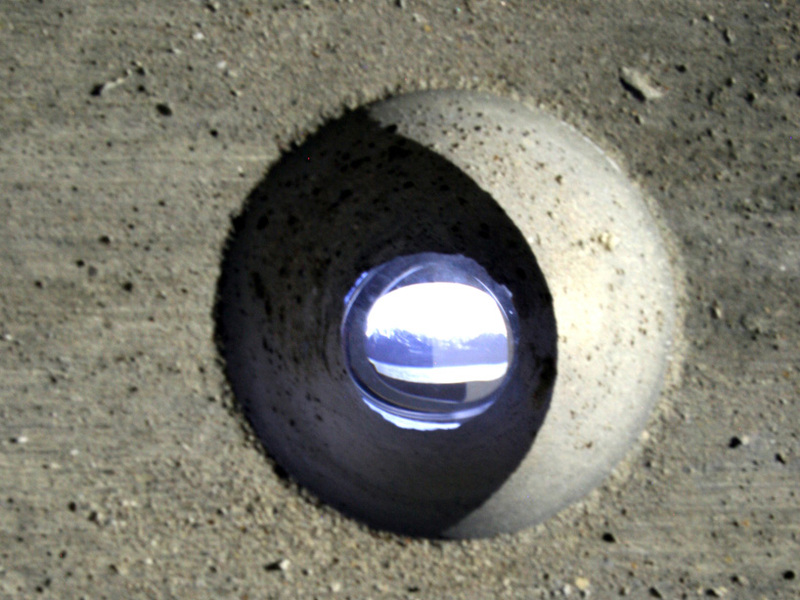 what le corbusier took with him was the understanding of a new material – reinforced concrete (invented by the french gardener joseph monier in 1867), but instead of using it as a substitute for other building materials in the way perret used mainly used it, he instead started to explore the medium as a way to challenge traditional architecture. 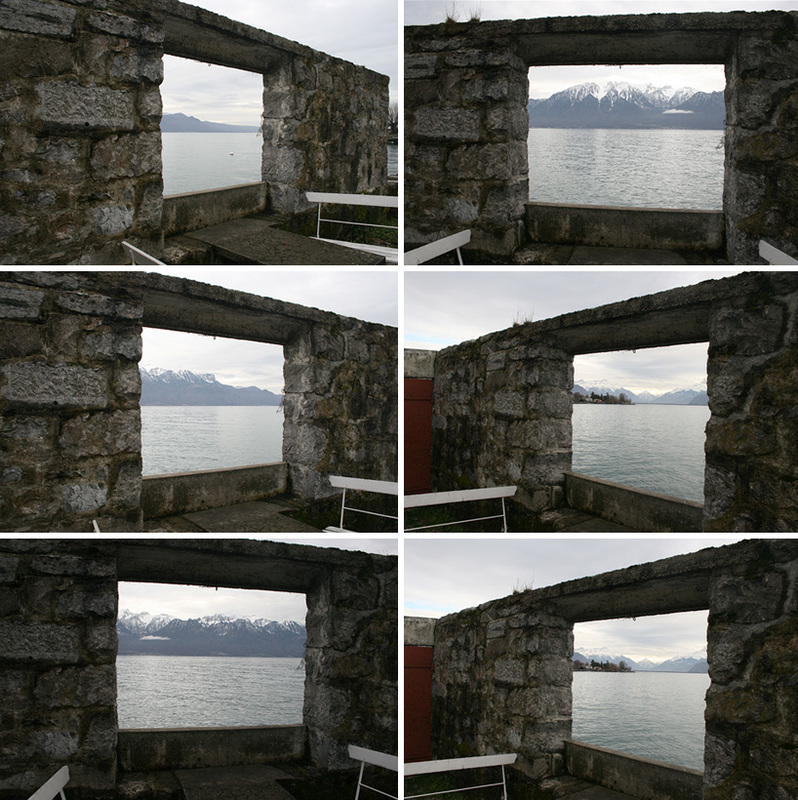 starting with maison domino in 1914, le corbusier developed his five points of architecture, testing it for the first time in the house he designed for his parents on the shore of lake geneva an eleven-meter long window was the main feature of the building. this fenêtre longeur was a clear break with the traditional french window that, according to perret, was the right way to connect the person to the environment by connecting the sky to the ground. soon a bitter and public dispute between perret and le corbusier broke out after perret criticised le corbusier for his use of the horizontal window. 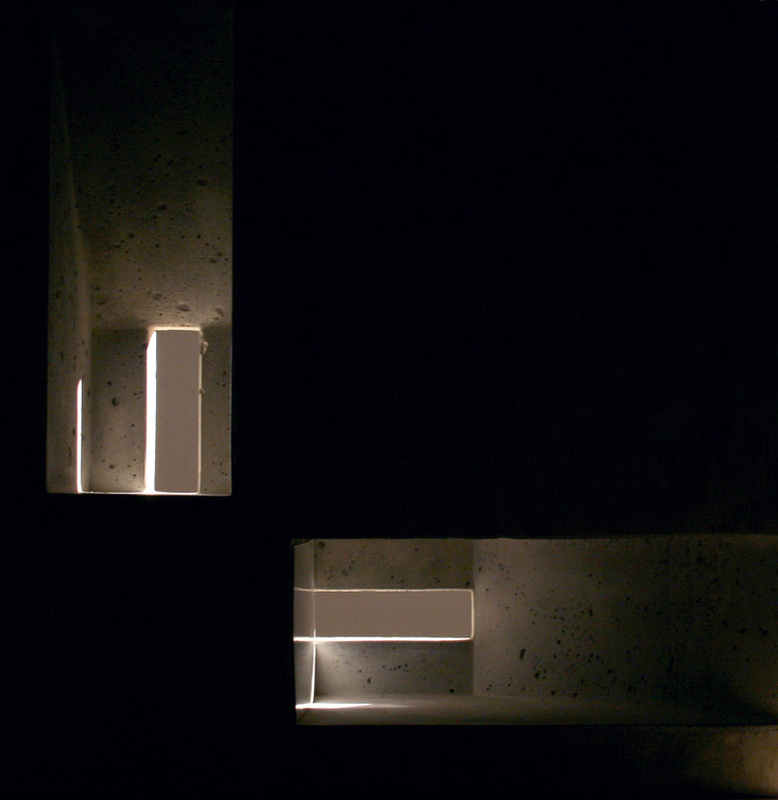 storp weber architects’ ‘le corbusier – la fenêtre longeur’ explores how both arguments are explored: which window lets more light into a space. the house by the lake was designed by le corbusier before he decided on a site, and only minor adjustments were made afterwards. 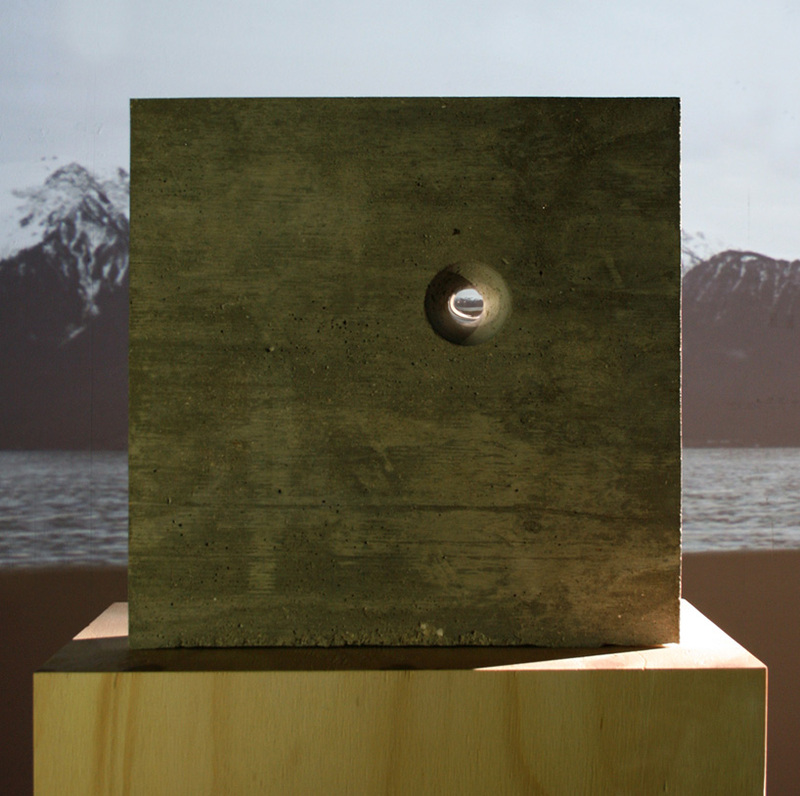 he reportedly used the drawings with the window to find a location in order to capture the view across the lake towards the alps. exploring the french architect’s anthropometric scale of proportions, ‘le corbusier – the arrested view’ interprets the numbers of the french architect’s modulor system and its construction by looking at the diagonal and the golden section to define its design. 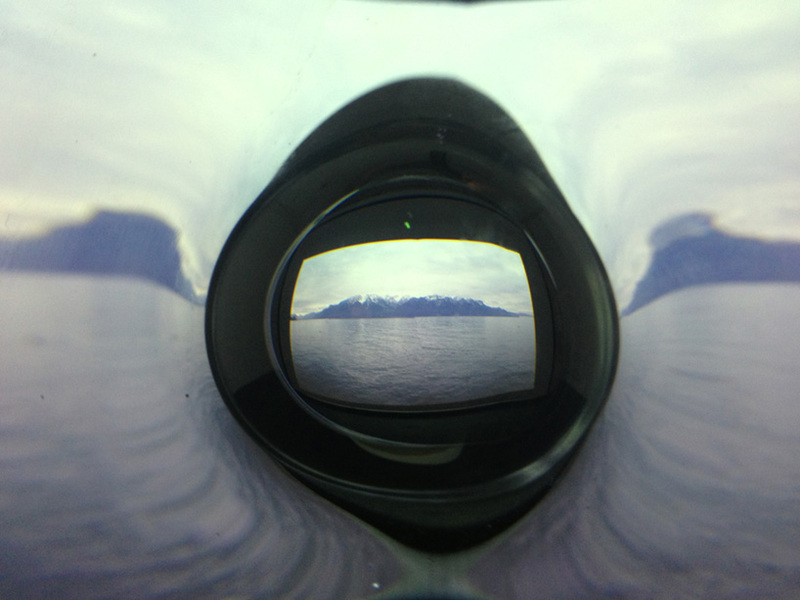 a double-water C-filled lens arrests the view, condensing it in a small image visible through an opening at the front. 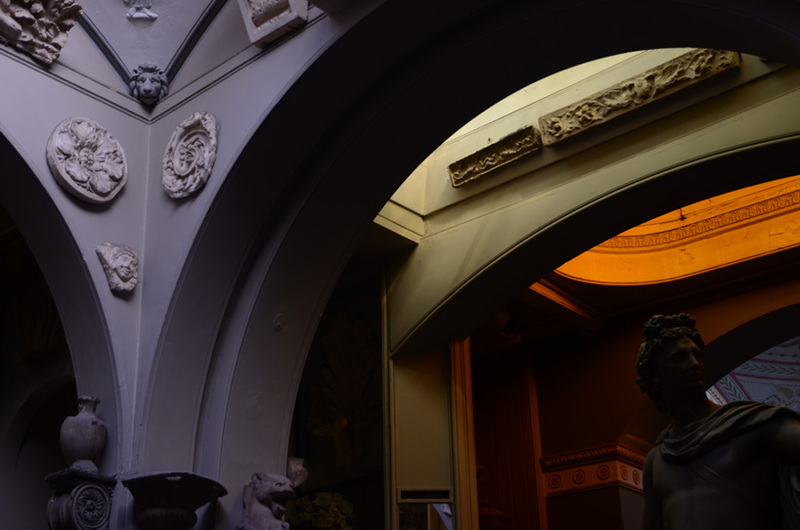 ‘sir john soane – the folded views’ is a response to the picture room in the soane museum, which, like the focal aperture of the lakeside house contains a large panorama within it, this time, of hogarth’s london, condensed behind panels in the picture room. having several hinged layers of walls the rooms contains the same amount of pictures and drawings like a room four times its size. 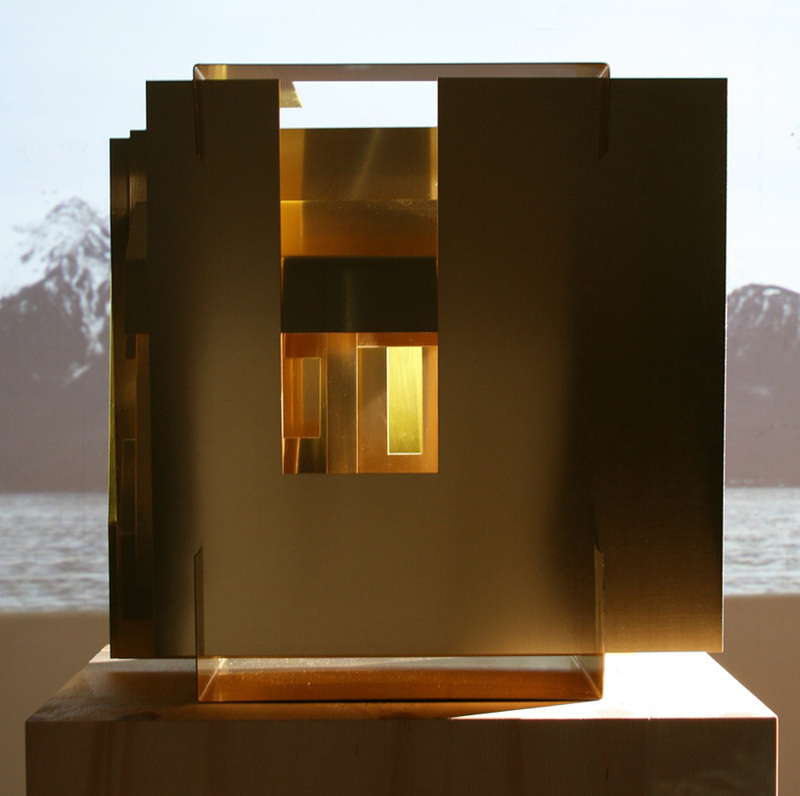 this third model simulates the shafts of light, which are released before the panel is fully opened on to the breakfast and monk’s rooms below and behind. 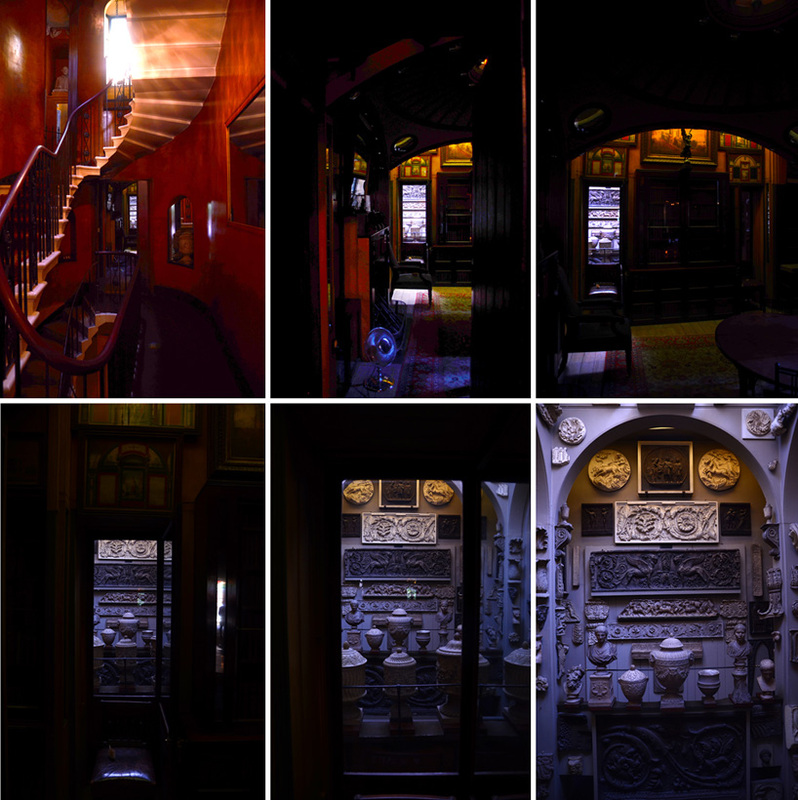 the last model takes you on a journey through the lumiére mysérieuse, from the hallway to the crypt in lincoln inn fields, so that the viewer experiences the continuous modulation of light to dark, fragmentation of rooms, and depth of field. 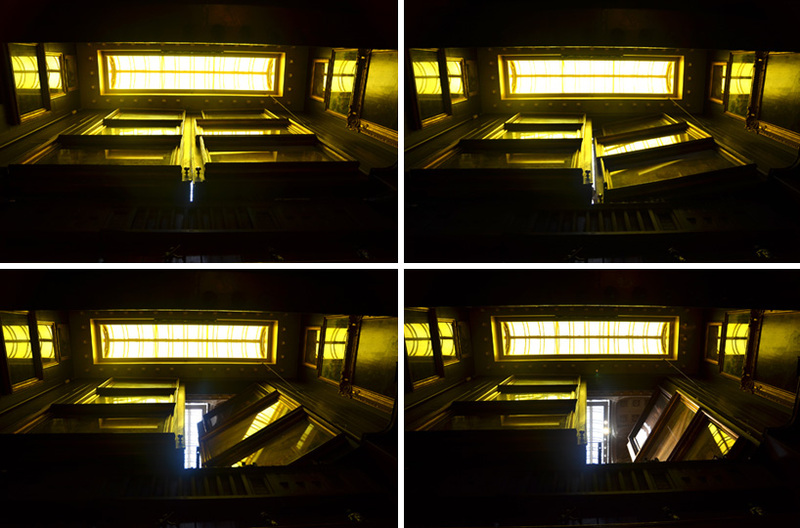 viewed from its side elevation, ‘sir john soane – the lumière mysterieuse’ physical structure is revealed as a series of polished brass plates that have cut outs and folds responding to the different sections of the house, and simulating the burnished and reflective lighting effects. photo taken by storp weber architecture, august 2013.
sequence of photos taken at the thresholds of the views. 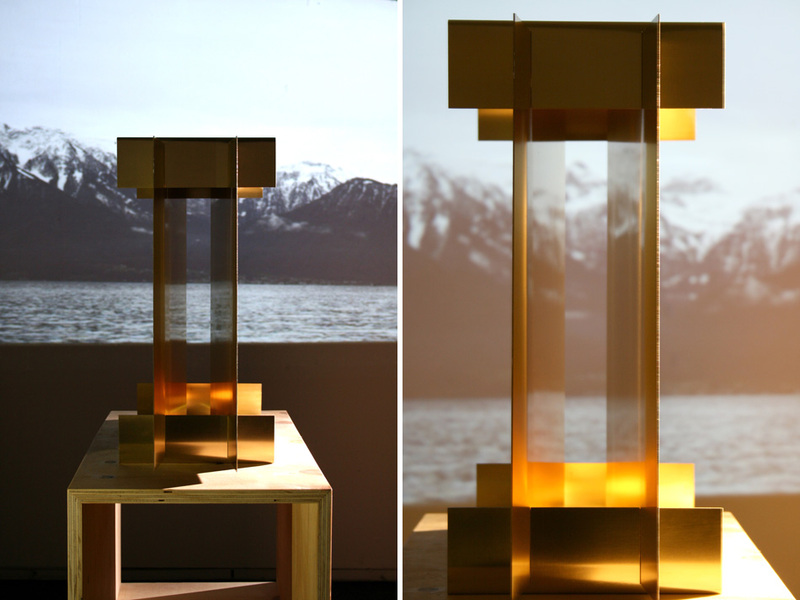 these photos were used to determine the openings in the brass planes and the sequencing of the differently lit spaces in the model. 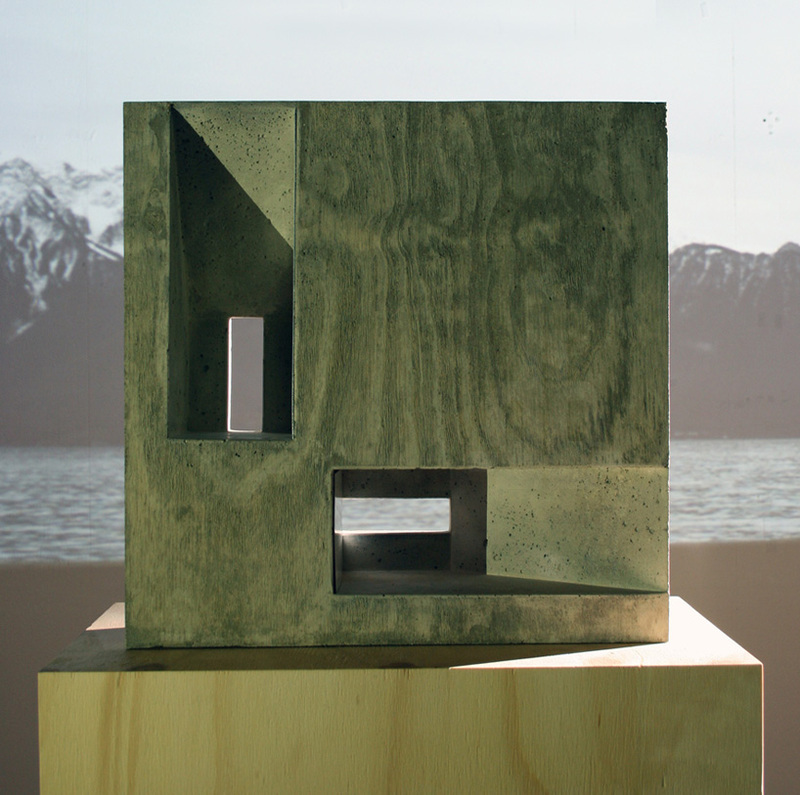 the models are on exhibited at pitzhanger manor house, sir john soane’s former country house in ealing, west london until november 3rd, 2013; and again in march 2014 as part of a le corbusier retrospective.